As Hollywood seems to be stuck in a perpetual cycle of reboots and retellings, it was only a matter of time before the publishing industry began to follow suit. What's old is new again, and a group of authors has turned to one of the oldest and most revered storytellers of all time. The plays of William Shakespeare are set to be reimagined by some of the industry's most unique voices in a series known as the Hogarth Shakespeare project. Last year saw the start of the series with the release of Jeanette Winterson's take on The Winter's Tale, The Gap of Time. With installments by Jo Nesbo and Gillian Flynn slated to drop in the coming years, the project seems to have recruited a varied list of bestselling authors. 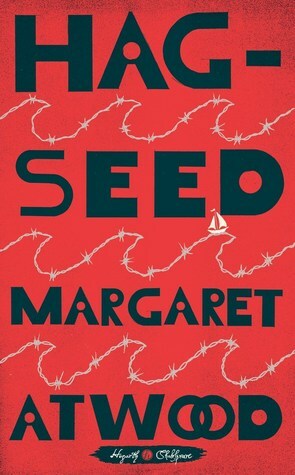 In Hag-Seed, author Margaret Atwood provides her own version of Shakespeare's The Tempest. Felix Phillips is no stranger to crisis. After the loss of his daughter Miranda, he sought solace in his role as theater director of the Makeshiweg Theater Festival. For twelve years, Felix captained the organization through settings of great works. Despite his productions' lackluster reviews, Felix has high hopes for this year's project. A dream of his for over a decade, Felix will finally direct his version of The Tempest. But life has other plans for Felix. The tepid reaction to his last effort combined with his peculiar vision for this year's offering give his understudy Tony and the theater's board enough reason to relieve him of his duties. Furious and embarrassed, Felix retreats to a rural dwelling to reflect on his misfortune and plot his revenge. With only his creative intellect and the guidance of his deceased daughter to rely on, he soon accepts a job teaching literature at a local correctional facility. Devoid of the resources of his previous position, Felix and his ragtag troupe of inmates embark on finally seeing his fantasy production to fruition. I hadn't read The Tempest since high school, so I was a bit apprehensive about tackling this novel. Fortunately, Atwood's writing kept me engaged throughout the entire book. Felix is a lovable underdog who I couldn't help but get behind. Hag-Seed works both as a standalone story and in relation to the play it is reimagining. Felix is an obvious double for Shakespeare's Prospero. As he lures his wrongdoers into his revenge scenario, Atwood relishes in the absurdity of the situation. A brief summary of The Tempest follows the conclusion of the novel, adding clarity and depth to the already fascinating story. While I'm not usually a fan of retellings, I thoroughly enjoyed Hag-Seed and can't wait to see the next installments in this ambitious project. This entry was posted on Sunday, November 13, 2016 and is filed under Book Review,Hag-Seed,Hogarth Shakespeare project,Margaret Atwood,Shakespeare,The Tempest. You can follow any responses to this entry through the RSS 2.0. You can leave a response. Same here. I'd always heard great things about her, but this was my first novel to read. I did read an interesting collections of essays by her a few years ago that helped to cement my desire to read her works. Nice, I enjoy a good retelling but will admit to being apprehensive about the tackling of these great stories. I am delighted to hear this not only entertained but breathed new life into the Tempest. I agree, retellings are a tricky business...especially when the source is such a revered classic! I've heard similar responses to The Heart Goes Last. It almost deterred me from this one, but I'm happy that I decided to read it after all! I haven't read The Tempest myself either, so it's good to know that you don't have to have read it in order to be able to enjoy this book. I do love my Shakespeare though, and the plot to this one sounds really cool. Gonna have to think about it though! As with any Shakespeare, I think it takes a bit to acclimate to the story. But it ends up being totally worth it in the end.